Growing up, I was never surrounded by motorcycles. There wasn’t a family member to pass the torch or a friend that exposed me to the joys of two wheels. My first foray into the world of two wheels was on my road bike. At the time (2008), I was a student in Chicago where I became addicted to the adrenaline of zipping past cars and squeezing between buses — but I wanted more. Fast forward to 2013 — the year I moved to Pittsburgh for a job and when I met my boyfriend, Adam, the one who completely changed my life with riding. He first taught me how to ride on a 2011 KTM EXC 450. Even at 5’9 I struggled to touch the ground with my tiptoes and was going about 5mph down a pot hole infested alley. At that point I just wanted to learn how to ride street and would have never thought that I would become obsessed with riding off-road. 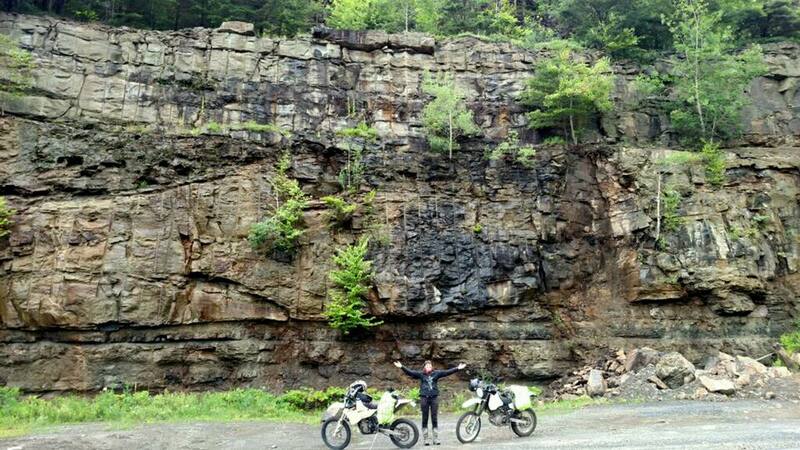 Adam & I riding through Pine Creek Gorge, The Grand Canyon of Pennsylvania. I would watch videos of Adam ripping through trails that made me long for that same adrenaline feeling. My first motorcycle was a 1972 Honda CL175. I quickly outgrew it and moved on to a 1992 Suzuki DR350. That’s when I began learning how to ride off-road. The conditions weren’t ideal the first time I went out. It was a cold March day with snow and mud covering everything. I constantly slipped around, got stuck in thick muddy puddles, and went through trails where I was just waiting to wipe out — but I loved every second of it. I was challenging myself and learning how to handle my machine in a completely different way. 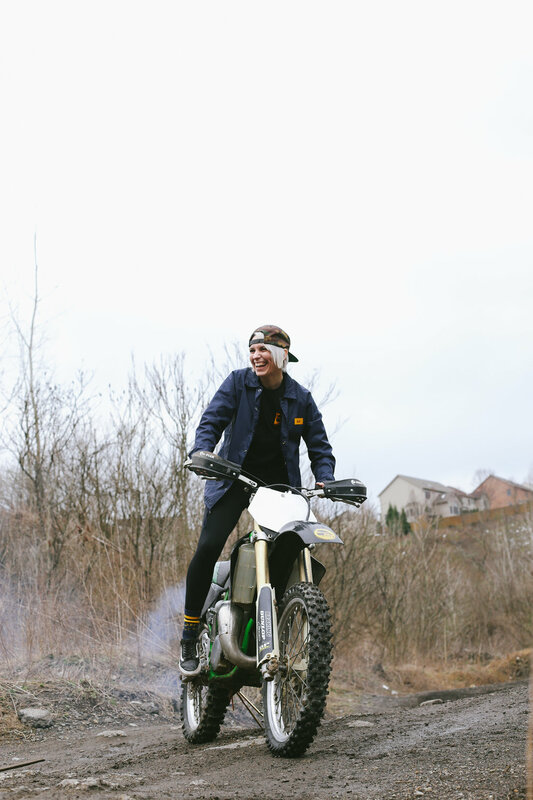 I then started tagging along with Adam, and attending group meet-ups with Pittsburgh Dual Sport to get used to riding a variety of terrains, attempting hill climbs, and learning the ways of the trails. The more I rode, the more I wanted to learn as much as possible. I longed to be one step closer in accomplishing obstacles that I had at first only dreamt about. During that first year of riding off-road I was set back when my DR350 was stolen out of our garage. I was devastated. I was on a high from all of what I had learned and was finally comfortable riding dirt and attempting new challenges. Then it was all stolen away from me. (Update: Miraculously, after almost two years, my DR350 was recovered. It’s in terrible shape, but I’m extremely lucky to have it back!) However, finding light in the situation, if my DR350 had never been stolen who knows when I would have discovered the wonderful world of two stroke dirt bikes. After our garage was broken into Adam added a 1984 Honda XL250 and a 2001 Suzuki RM125 to the collection. At that point, I had only ridden my DR350 off-road and never experienced a dirt bike. All it took was Adam handing me the RM125 for a go, and that was it, I needed a two stroke. The get-up and go of it had my heart pumping, and how light the bike was made me feel as if I could do anything. A few months later, Adam surprised me with a 1996 Kawasaki KX125 for Christmas — all wrapped up with a big red bow. In present time — I’m still riding my KX125 and am currently trying to advance in my riding skill. 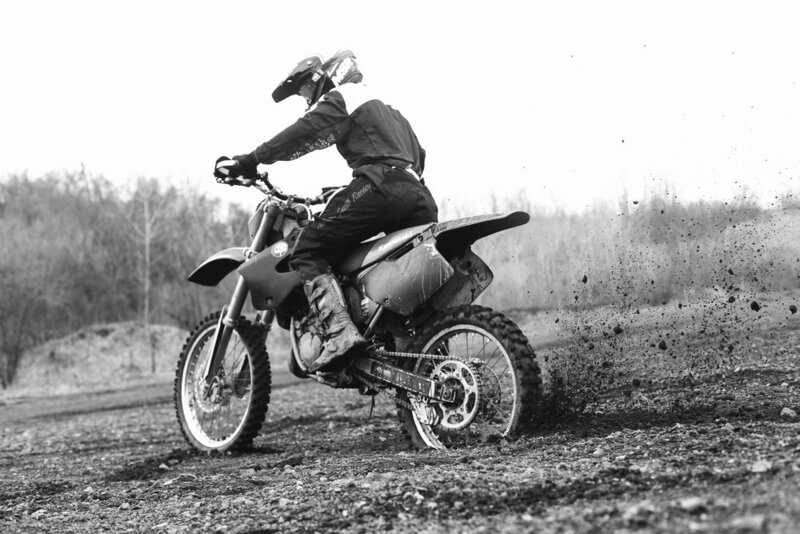 That’s one of the many things I love about riding off-road — that you're constantly challenging yourself by attempting new obstacles, and there is always something new to learn, no matter how good you are. Having Adam as my “coach” is extremely helpful — especially since he has been riding dirt since he was 12 years old. Having the man you love teaching you, just makes riding that much more special — especially when you get to share it together. We go out as much as we can & he’s the one who challenges me in taking on difficult single track, steep and intimidating hill climbs, and so much more. Adam is constantly throwing something new at me so I can grow as an enduro rider. As for the future, I’m seeing orange! Although I love my KX, I’m starting to outgrow it. Next year I plan on searching in the depths of Craigslist for either a KTM 200 or 250 XC-W. After riding a 200 XC-W my mind was blown. It handled so well and I felt much more confident and comfortable riding trails — and that extra power doesn’t hurt either ;). Once I power up to a new bike and advance my skill level, I also want to take a knack at enduro racing and maybe even some hill climb challenges too. Enduro racing would be a completely new ball game for me, but even if I finish last, it’s something I want to get into and work my way up. And as far as hill climbs go, I have a hard time not wanting to go up every intimidating hill I see — even if it’s above my current skill level. The fact that there are competitions and challenges for hill climbs is awesome to me and something I would eventually like to try. Learning enduro and riding off-road has been the best experience of my life, and continues to bring constant joy. For me it has even been a little intimidating learning as an adult. I catch myself occasionally thinking of the repercussions if something goes wrong, but you just have to let that adrenaline fuel you. Even when I drop my bike, time after time, I challenge myself (if I completely didn’t wipe out) to see how fast I can pick up my bike and get going again. There’s nothing better than riding through nature’s beautiful playground with the sweet smell of two stroke smoke and the intensity that fills your body. I’ve been lucky enough to meet someone who has shared riding with me. I have met many women who say they are intrigued to try it, but have a hard time getting started. My hopes are that women go for it! The community is overwhelming full of support and it’s nice to have that when you’re starting something outside of your comfort zone. Fellow riders are always there to check on you if something goes wrong & there to cheer you on through tough terrain. It also makes me super pumped that some of my closest lady friends I ride street with have sparked interest in riding off-road! It’s so fun to take them out and show how incredible it really is and I’m overjoyed when I see how stoked they get riding off-road. Reminds me of the feeling I had, and that I still get, when I first rode Adam’s RM125 — a feeling everyone should get to experience. Since I have started riding there has been so much growth in the local riding community. Mothership Moto, a new motorcycle repair shop co-owned by my boyfriend Adam and two of my close buds James and Jason, is exactly what Pittsburgh needed. Not only are they a repair shop, but they are building a community in the city with plans of awesome events & rides. They have only been open a few months (opened November 2016) and the boys already have a garage full of bikes from dirt bikes to cruisers! I find myself there a lot and it’s incredible to be by their side witnessing all the rad things they are doing for the city. I’m also a part of the Maulies — a female riding group in Pittsburgh where we strive to carve out a space for female riders in our area. The ladies in our group rides street, but I am excited to say that two ladies have even started to enter the world of off-road (& that just makes me even more pumped —more woman entering the wonderful world of riding dirt)! 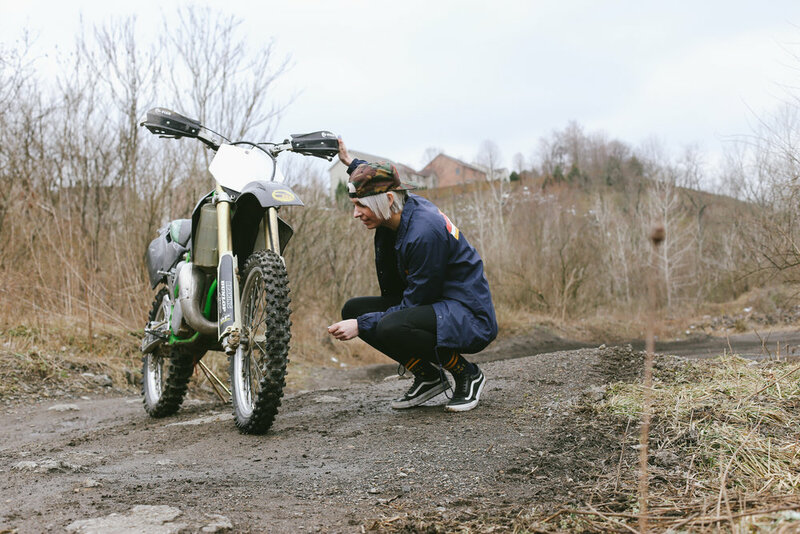 We have recently worked with Mothership Moto for an upcoming event bringing women riders (and women interested in riding) together, along with other moto events to make our community even stronger. Both Meghan & Adam have been a huge support and influence on the WLF community over the years. We're always bugging them to send over photographs that they posted up! They're a huge support from the very beggining. We love that East Coast style Meghan and her crew so naturally convey. 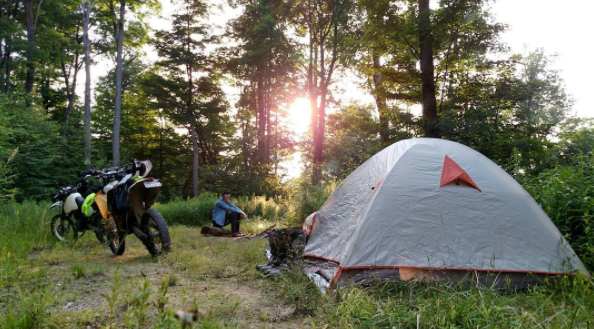 Whether she's hitting the road or tearing up the trails Meghan captures the true love of two wheels with every image that is shared. 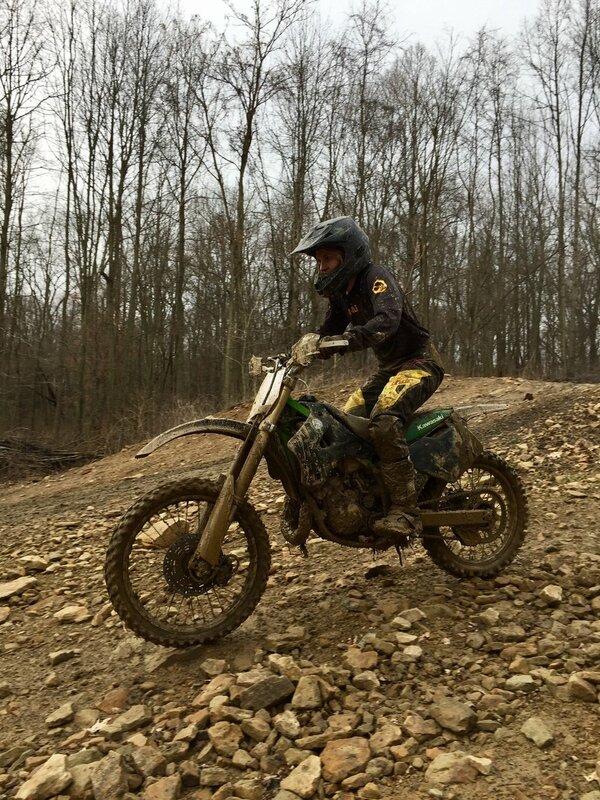 A big thanks from the entire WLF community goes out to Meghan and her amazing moto operation out in the PA! AMAZING gift from Meghan to the WLF crew! The new center-piece at WLF HQ! Skillz!!! Thanks Meghan!